I bought this at Pedal the Planet in Lexington, KY. I'm very excited about the bike. I think it's a very good-looking. And I've heard a lot of good things about the company. My own experience has been excellent. I've been e-mailing lots of questions to the company, and I have always gotten a thorough response the next day. Anyway, now I just want the weather to be a little bit warmer! I used just over a ball and a half of Rowan Handknit Cotton for this project; I still have a ball and not quite a half left--what else can I do with it? This little elephant is perfect. My brother and his wife and baby live a couple thousand miles away from me, so I'll probably only get to see them once a year. I hope that it will be a favorite toy that he'll carry around with him all over the place. If I'd done something to wear, he'll have outgrown it before we can say "boo!" I've never made a knitted toy before--this is fun! It's going so quickly; I've already finished the head and probably a third of the body. I still have the arms and legs and ears and then embroider the eyes, but I think I can definitely have this done by the time I go out to visit in April. I definitely want one for myself. When I was at the yarn store today getting the yarn for the baby's Elijah, I saw they had some Rowan Calmer on sale at 40% off. 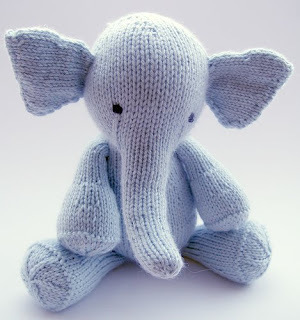 It's a pretty color, kind of greenish-gray, and it will make a cute little elephant. Mine will have those little plastic bead things in its legs and arms and bottom that make it a little heavier and floppier. I didn't want to use them on the baby's; I wouldn't want them to be able to work their way out of the softie and into his mouth!